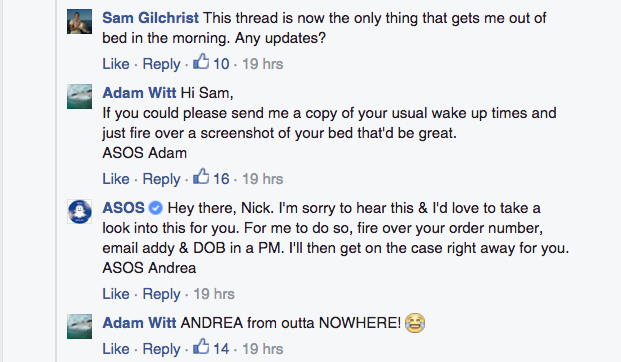 A recent complaint on the ASOS Facebook page has reminded Dr Mumbo we’re still a very, very, very long way from any meaningful kind of artificial intelligence when it comes to customer service. 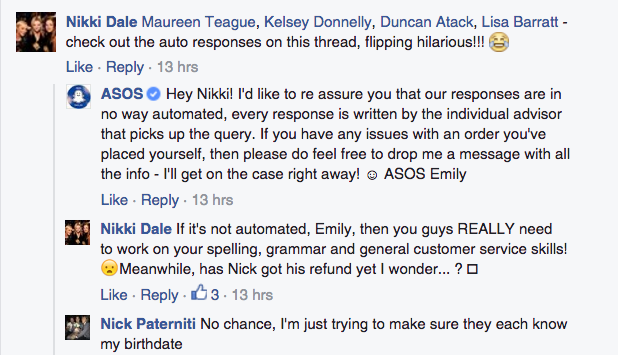 It all started with a simple complaint from customer Nick Paterniti whose return had been lost by the company. 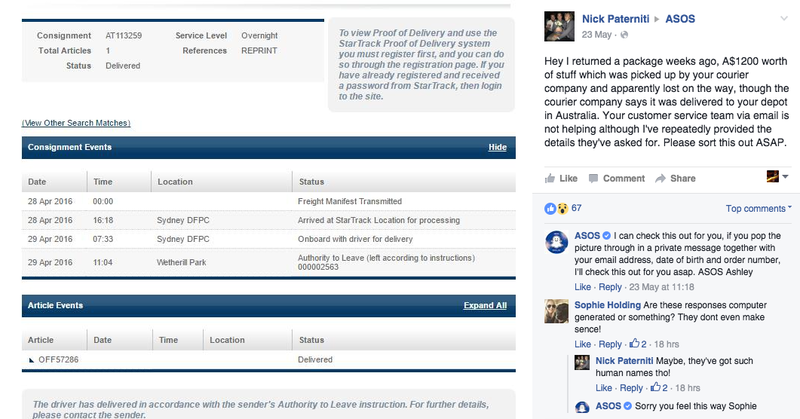 While he’d attached an image with the order details to the post the automated response from “Ashley” asked him to send it in a private message to the company, along with his details and date of birth – information he’d clearly already sent them. Unfortunately for ASOS they managed to misspell Brad as ‘Bred’ in the autoreply, irrelevantly telling him “our email queues can get a lil busy at times but we can deffo help you from here too just fire over your order number”, leading to yet more mockery of the ‘customer service’. That triggered yet another auto-response from ASOS. There are some occasions when you should just quit while you’re behind. Dr Mumbo wished Nick all the luck in the world in getting that refund. Has it occurred to you that it may actually be real people, picking from a library of scripted sentences, which makes them seem like bots? But probably still low paid, outsourced to [insert asian country here]. Hey, don’t forget that the ASOS thing is low cost. There’s no chance these are automated. It’ll be foreign workers with English as a second language, and sadly a response tool that shows them single comments and not the entire thread. I doubt the people responding even know this is all on one post. Had the exact same issue and less than a week ago posted on their page, so frustrating!!!!! I am so appreciate for this blog because there are some interesting points about live chat. I am so thankful for you and your blog. Thanks for sharing such a useful blog.